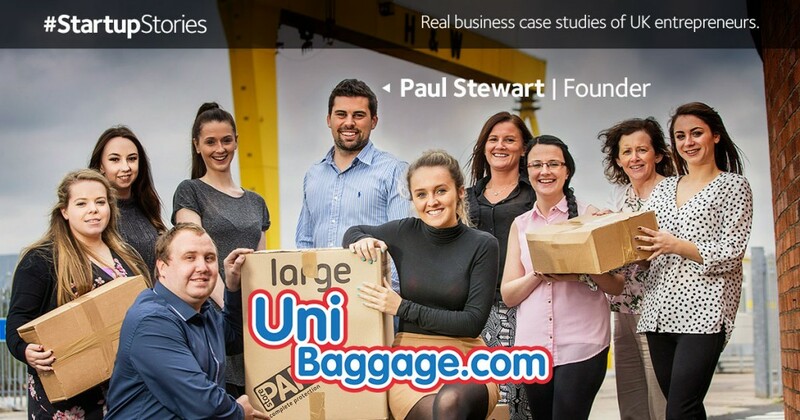 We spoke to with Paul Stewart – the man behind student baggage shipping company, Uni Baggage. Let’s get straight to it! Tell us about Uni Baggage. Uni Baggage is a student shipping company. We ship students’ belongings to and from University both within the UK and to over 200 countries worldwide. I was studying at the University of Edinburgh and was travelling home to N. Ireland two to three times a year. Having to move my belongings each time was proving difficult and expensive. I had to either fly and pay huge excess baggage fees or travel by car and boat which was also very expensive. I thought there had to be a better way of doing this, and from that Uni Baggage was born. What makes Uni Baggage special? We help over 30,000 students each term move around the world a little easier. Our customers are able to travel lighter and save money at the same time. They are also able to take items with them that they may not have been able to take without Uni Baggage. As the majority of our staff are university graduates we understand the problems students face and can provide exceptional customer support. What’s been the high point so far? We hit a certain milestone of sales last year and that put a smile on my face. When I set up Uni Baggage this was the figure that I thought I would be satisfied with, however we are now thinking much bigger. Has there been a low point? One winter there was severe snow and one of our couriers was unable to deliver our shipments for us, we had to move couriers last minute at great cost to ensure our customers items were delivered on time. We aim to offer an exceptional service and it all worked out in the end but I remember that time being a bit more stressful! Where do you see the business in five years? That seems like a lifetime away! We are currently focusing on our international orders, so we hope to have a lot more presence in the countries we ship to and from. We have a team of ten now, which is relatively small, so we will be aiming to double that over the next five years. We are also moving into our new offices in 2016 to accommodate this growth, the new offices are currently getting fitted out to our spec – we can’t wait to move. Who’s been you biggest influence in business? My Dad, he has been very successful in business. Fortunately, I have not required any investment in Uni Baggage as it is very cash flow positive so I was able to start it with just £500 of my student loan, however my Dad does provide some sound advice when I need it. What do you know now that you wish you knew in the beginning? Focus on what you want to achieve. Work hard on refining your cash flow and understand it from day one. Cash flow is so important – we were able to get it right after a few wobbles. What advice to you have for someone thinking about starting a business? Get stuck in and have a play around with your idea before putting any serious money into it. Speak to people who have been there and get involved in that industry as much as you can. Have fun with it. Flexibility, you will probably work more for yourself than anyone else but you will also have the flexibility to do what you want. I feel you also have a greater sense of achievement when looking back over what you have created. Do you want to share your Startup Story? Take our online interview now. Has Paul’s story inspired you to #ChangeYourLife and turn that dream into a reality? Take a look here for information on our company formation services. This entry was posted in Interview, Start a business, Startup, Startup Story and tagged startup, startup stories, Startup Story, StartUpStory on January 12, 2016 by Mathew Aitken. Being Head of Content entails overseeing MadeSimple’s blogs (five in all!) and any other content we happen to be producing. In his spare time Mathew is an avid film-goer, TV-watcher and Tottenham Hotspur-endurer.